Discussion in 'Grooming & General Cat Care' started by badw0lf, Nov 15, 2018. Yes. Because I am tired of losing tiny mice in the same realm where the sock gnome lives. Source: Have lazy lap cat. Needs to play more than 2 seconds. snini, kobata1928, tarasgirl06 and 3 others purraised this. Totally not judging you. Hope you'll provide a good review after it arrives. tarasgirl06 and maggiedemi purraised this. Lol! If it has a motorized sound to it, Feeby would run the other way. I once bought a mouse (much, much cheaper) that ran on batteries, but made a buzzing type sound. She took one look at it and ran in the other direction. Hope this thing works out better for you, considering what you just paid!!! snini, tarasgirl06 and misty8723 purraised this. At an estate auction I went to this summer I bought all the "cat stuff". With auctions that have more stuff than time they often batch everything together and you bid on all of it even if there is only one thing there you want. Anyway included in the stuff was a small scratching post with a flexible "tail" on the top and a fluffy ball on top. My cats gave it a ho hum and never touched it. I put it out for the feral kittens to try. One spent hours catching and releasing the ball. In just a few days the ball was gone and the thing was reduced to a stick. When I was in a "big city" I went to a Pets Mart and spent $30.00 on some wands thinking maybe they would be a hit. The feral kittens were afraid of them and ran away and hid. What finally did work was a boot lace tied to half a fishing pole. And their favorite thing of all is a cardboard box they have been shredding. It's their third one. The others were reduced to crumbs. tarasgirl06, FeebysOwner, Furballsmom and 1 other person purraised this. I'd love to hear a review on how this works/holds up if you have a cat that's half ninja, half murderer when it comes to toys, because Baby Girl is fierce and relentless with toys. It's like she was raised by kick-boxers that were raised by rabid wolves. tarasgirl06, Kefa, FeebysOwner and 2 others purraised this. Agree with 1 bruce 1, would like a full review. I tried doing something like this with a $15 remote control truck, and had two problems. First, he was scared of the noise. Second, as soon as I turned it off and left the room, he tore the feathered thing I was using to smithereens. Also, he likes toys he can turn on himself, so I need to know if the button is cat capable. yeah i'm over $400+ in emergency and regular and diet change in bills this week. Hopefully this will help him be a more active, moving cat. Roman attacks the Roomba with his paws and like... one time it was trying to vacuum and prodding at his backside. He just sat there and not move, angrily meowing at it. It was funny. Decided to get rid of it though because he could just break my vacc one day. I thought he would be riding on it. My dreams are crushed. DreamerRose and tarasgirl06 purraised this. I will. I hope it is durable like it claims it says it is. Roman doesn't "destroy" things but he attacks Roombas to the point I got rid of it so.... as far as the motorized sounds it does make, can't imagine that it's too loud though. So you control it through your smartphone and there's different modes you can pick from autonomous, stand-still mode, or drive it yourself I'm assuming. 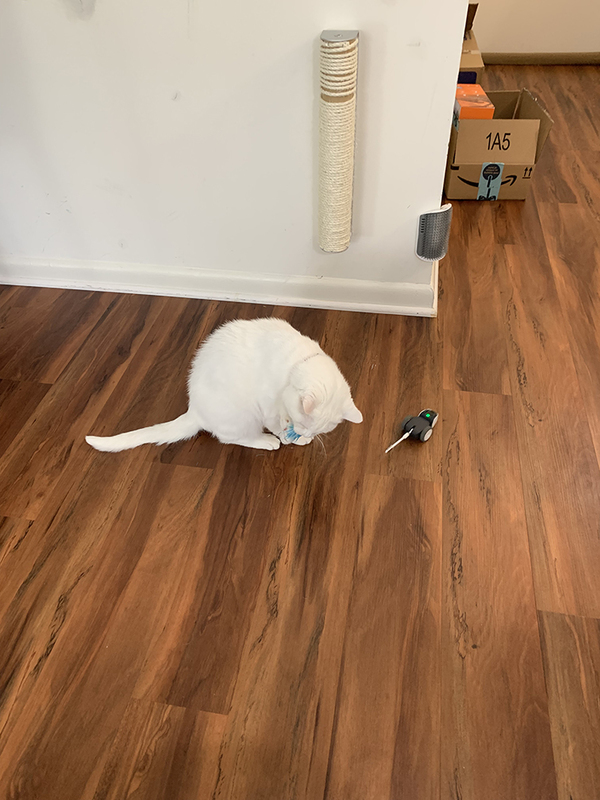 Stand still mode is where the mouse doesn't move and the tail moves... they said it was good for senior cats who don't chase anymore. I'm not sure if you can make your cat activate it unless you put your phone or ipad on the floor. tarasgirl06, maggie101, Kefa and 1 other person purraised this. So wish I had wood floors! Kefa, m3rma1d and FeebysOwner purraised this. happy thanksgiving to all americans out there. First impression (Actual review later)i know it's only been a day - but all robots seem to have this sort of flaw where it gets stuck when you have stuff on the floor (it's better to have surge protectors mounted off the floor.. or in it's cord organizer box... but maybe it's just me cause I have a lot of wires hiding under the couch). This is best suited for people with LOTS of floor space, no kid toys all on the floor. It will go under your couch. There is a carpet option. I turn that on because I do have carpets outside the litterbox and kitchen. The biggest downside is like.... The battery life. You can customize the autoplay on how much it pauses and waits, or if you want frantic movement. But let's say I started off at 95% I will be at 70% 16 minutes later. The good news is it charges fast. I don't have an exact time. The tails are expensive since they only have the $40 big tail bundle which comes with several tails but Roman likes to dismantle feathers really fast. I think people can mod their tail and put a mouse at the end of it. i'm giving it like another 2 weeks to decide whether or not this is worth it. To be honest, I don't think its worth it for me because like the Roomba, you have to be there to make sure it doesn't get unstuck. MargoLane and FeebysOwner purraised this. If you all will get together, pitch in, and get me one of those.....We can see how well the company handles warranty claims and damages. catspaw66 and tarasgirl06 purraised this. Mousr Holiday Bundle! sale for cyber monday. this pack includes the tails (8?) instead of 2. i still have yet to do my full in depth review, I'm waiting for the site mod to put a page up for me so I can post there. Give us another update after a few weeks! My cat is ground hunter and wants only to chase things all over the floor. Even if you don't love it, did your cat love it? FINALLY the moment you all been waiting for! Notes: Limited time, $119 for mouse + 8 tails; originally $150 for 2 tails. 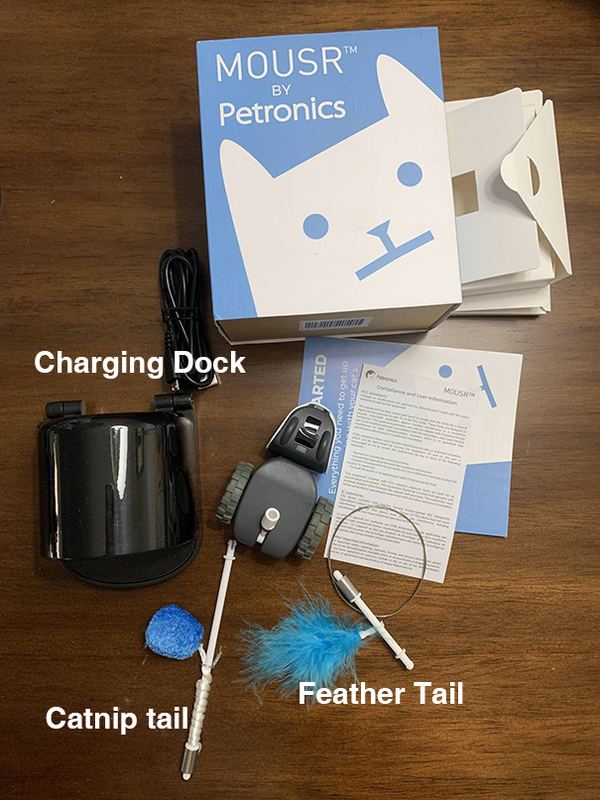 A bluetooth-connected autonomous mouse robot with interchanging tails and built-in sensors. You can rotate out with the 2 tails you get in the base-pack. Or for an additional $35 you can get 10 additional tails seen here. You can control this mouse yourself or let it roam autonomously through your smartphone (Android and iOS). The app holds the soul of the Mousr, so customization is super important here. There are 3 modes of how to control your Mousr. For something advertised to be self-driving it's nice to have the option to manually drive. Developers need to update the app to make the RC more user-friendly. Control it yourself. The whole point to this right? Not really, this was more advertised to be an autonomous mouse, something to keep your cats on their toes. You can drive it yourself but it takes some practice and some recalibration. It's laggy and can lose track with your phone sometimes. I didn't spend much time on RC mode. Same thing as simple control mode but with an accelerator. Speed: "Fast" is only recommended for expert drivers. Track my position: Turn this feature on if you plan to move around while driving the Mousr. Note: using this feature may require using the red reset button more frequently. 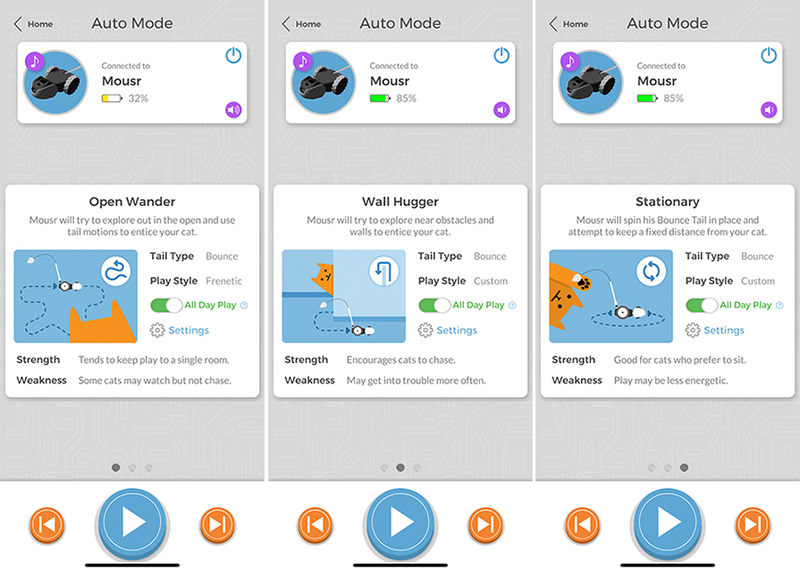 Driver assist: Turning this feature on adds computer-aided control to make turning easier and to help Mousr get free when his tail is stuck. This was the selling point for me. Because, cats are smart. They know that you're possibly behind controlling it from your phone. Within autoplay mode, there are 3 preset modes and a settings menu where you can customize it yourself. Open Wanderer: Mousr will try to explore out in the open and use tail motions to entice your cat. Strength: Encourages cats to chase. Stationary: Mousr will spin his Bounce Tail in place and attempt to keep a fixed distance from your cat. Strength: Good for cats who prefer to sit. Play may be less energetic. Advanced Customization: Same for all autoplay settings. Floor Type: Bare Floors, Carpeted Floors. *if you have mixed floor types, it recommends Bare. Speed: Note: "fast" will drain the battery more quickly. Pause: This sets how often the Mousr pauses to give your cat a chance to interact. Many cats will wait until the Mousr is no longer moving before they play. Struggle when caught: When enabled, Mousr will actively try to get away when he detects he's been caught. If disabled, Mousr will play dead. Heavy duty-built mouse can withstand rough play. If it flips upside down, it will flip right side up by itself. 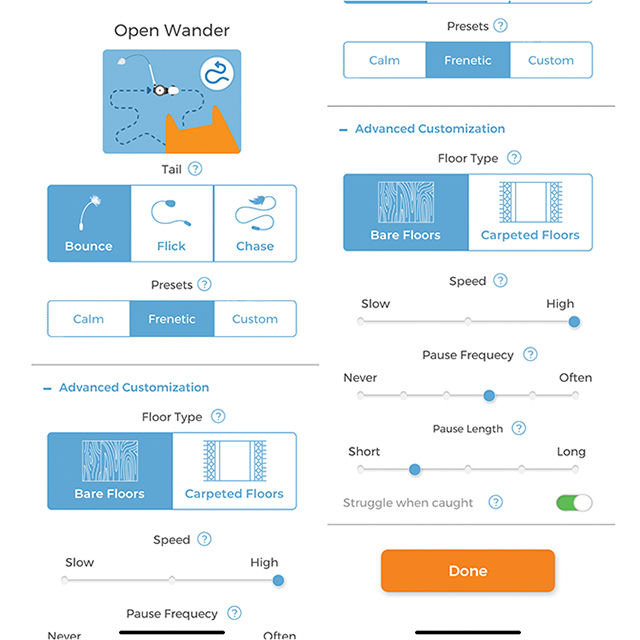 Customization within the Mousr app can let you toggle between carpet and bare floor mode. It had no trouble going on and off my area rugs. I have not tested with every type of rug, but I would suspect this might have trouble on types of rugs your vacuum gets stuck on. An area rug will not stop this from functioning. 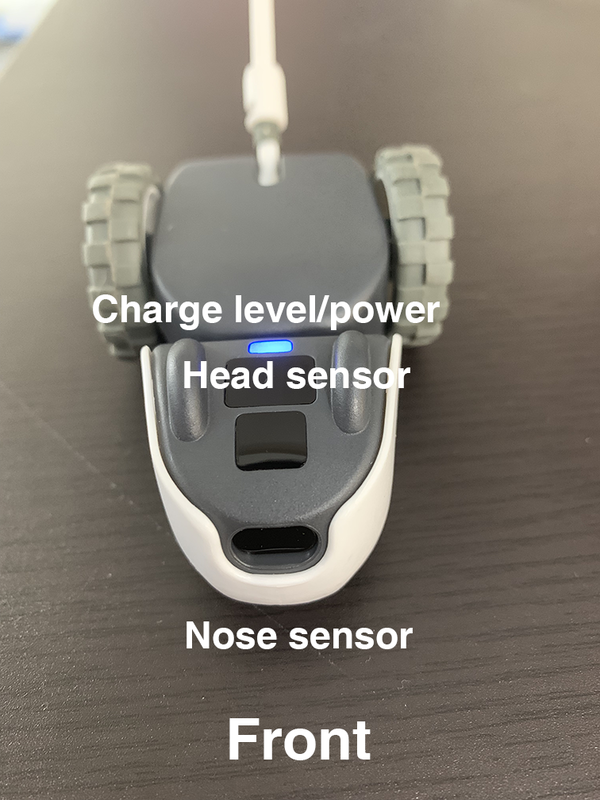 It is pivotal to wipe the nose and head sensors periodically or your Mousr will get stuck in weird crevices, corners, etc. I actually had it wander under my oven. I wrote to Customer Service and they never heard of that happening before and asked me to follow up. Since I cleaned it with an electronics cleaner (or 99.999 % alcohol) it hasn't been acting weird. I need more time with this. First time was probably my bad. I only have two to test out. I reordered the holiday bundle so I can have a fuller experience with different types of tails. If your cat is known for destroying feathers, the feather attachments won't last very long. I have already seen Roman rip out feather trails. To remedy this is not to buy an additional tail bundle, but possibly modify it and glue your own DIY feathers on. Or maybe even a small mouse. This rating is highly dependent on your cat's play style, but I rated it 3.5 because it's cool you can change out tails, but it's not cool that it costs $34 to buy more tails. I see myself modding these or adding-on myself in the future. Considering we are living in the golden age of rechargeable devices, one would expect long battery life, even for small device. 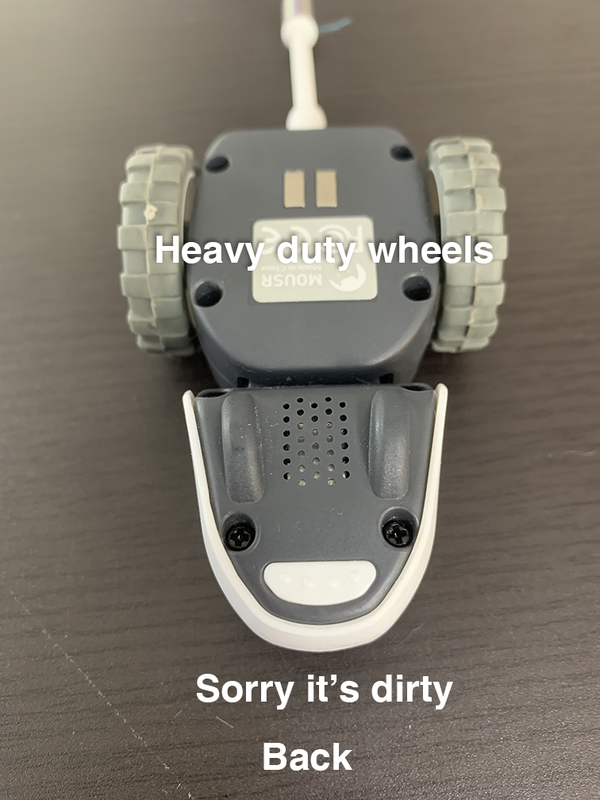 This does not hold true for the Mousr. Experts say you should play with a cat 10-15 minutes a day. I started out fully charged at 100% and because of my customized settings on the autonomous side, it drops down to 67% after 16 minutes of play (fast, frantic, "play all day" mode.) I expect to get about 30-45 minutes of play until it hits 0%. Sounds like a mini-RC car going across a hard floor. No motorized or engine sounds. Might startle your cat for the first time, but nothing to be concerned about. By default, it has charging sounds on, including the mouse connecting/disconnecting. You can silence this, but I keep it on so I know where it is if it's out of my sight. This is entirely up to your cat's personality & preferred play style. My cat is a lap cat and loses interest in manual playing really fast. He likes stuff dragging on the floor (tiny mice, not big ones) shoe strings, feathers being dragged on the floor-- ie: feathers on sticks. It was really hard for me to engage him in play because I had to be physically moving to keep his interest. He is not a cat-wand cat. He doesn't like laser pointers. This is the only toy I saw him use for more than 5 minutes. I originally didn't get a good first impression because of my Mousr's sensors, but this is something you can only judge with time. I would say for me, yes it's worth getting. Otherwise, he's only getting 0-5 minutes play per day but this increases his activity level and lower levels of stress (which is what a FLUTD cat needs). Customer service: Can't remember if they have a support line, but I emailed them about my oven issue, they replied in a couple of hours but I have not heard back from them yet after my first initial reply. If you buy it through Paypal on their official website, you technically have a 6 month return/refund period--opposed to Amazon where you only get 30 days. Videos will be posted later since it takes time to edit. Kefa, maggie101, Boris Diamond and 8 others purraised this. Thanks so much! The is really helpful and detailed I might splurge on this at some point!! Great review! You are very thorough AND provided graphics.